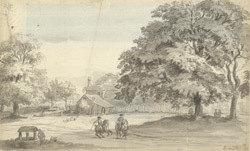 View of the old deer park at Richmond with two soldiers on horseback. The park was created by Charles I in 1637 to provide hunting grounds for the royal palaces at Richmond and Hampton Court. In the 18th century two ponds were created for angling with several types of fish imported for the purpose.